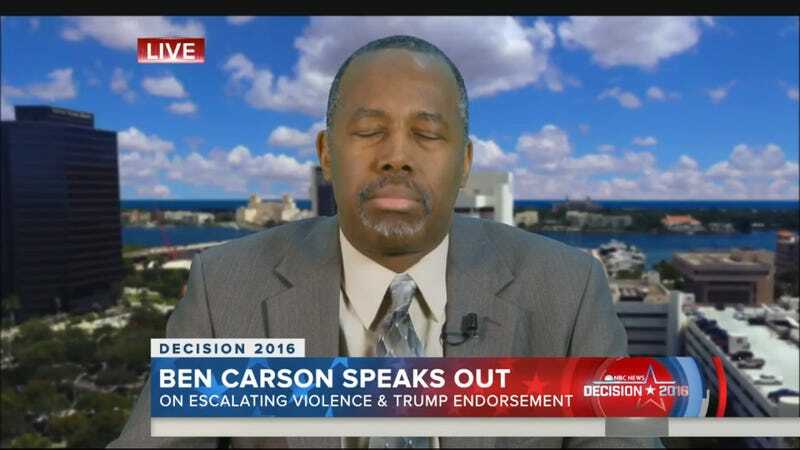 Sleepiest badger Ben Carson roused himself early Monday morning to appear on some morning shows, where he defended his new BFF Donald Trump, claiming that violence at his rallies was the fault of protesters alone. On MSNBC’s Morning Joe, he called upon protesters at Trump rallies to engage in “civil discussion.” Just like Donald Trump and his sucker-punching voter base. Meanwhile, on the TODAY show, Matt Lauer played Carson a couple clips of Trump doing Trump, urging his followers to “knock the crap” out of protesters. “Are you comfortable with that temperament in the Oval Office?” Lauer asked. Savannah Guthrie followed up by asking if Trump bears any responsibility for the violence at his rallies, by, say, calling for someone to punch a protester in the face. “Well, again, I think we have a tendency to focus on the wrong thing there. The problem is that there are those who are being taught that if someone disagrees with you, you have the right to interfere with their First Amendment rights,” Carson murmured. Saul Alinsky, a community organizer, is a bit of an obsession for Carson; he also brought him up during his concession speech at CPAC. Alinsky died in 1972. So there we are. There it is all is.